The National Environment Strategy and Action Plan, 2016–2023 (NESAP) aims to ensure that environmental protection and sustainable natural resource management are pillars of the country’s socioeconomic development. 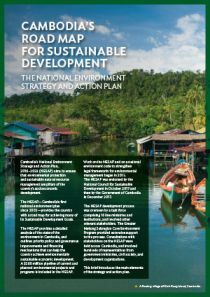 The NESAP—Cambodia’s first national environment plan since 2002—provides the country with a road map for achieving many of its Sustainable Development Goals. It provides a detailed analysis of the state of the environment in Cambodia, and outlines priority policy and governance improvements and financing mechanisms that can help the country achieve environmentally sustainable economic development. The Core Environment Program will be an important partner of Cambodia in realizing the NESAP’s objectives. Under the Core Environment Program’s Strategic Framework and Action Plan, 2018–2022, two large investments have been identified to directly support the NESAP’s implementation. One will support integrated and sustainable land use management. The other will aim to improve the quality of the rural environment, focusing on pollution control and waste management. The Core Environment Program supports the Greater Mekong Subregion in delivering environmentally friendly economic growth. It promotes regional cooperation to improve development planning, safeguards, biodiversity conservation, and resilience to climate change—all of which are underpinned by building capacity. The program is overseen by the environment ministries of the six countries in the subregion and implemented by the Asian Development Bank-administered Environment Operations Center. Cofinancing is provided by ADB, the Global Environment Facility, the Government of Sweden, and the Nordic Development Fund.